See a visible lift in just two weeks* with this luxuriously innovative, Korean beauty-inspired mask. Great to use before special occasions! Beauty-booster: ideal supplement to the TimeWise Repair® regimen. Great to use before a special event or glamorous night out. From editors and bloggers to industry insiders, those in the know look to Korea for the latest skin care innovations. A breakout trend from the world of K-Beauty, sheet masks in various materials are gaining fans across the globe as an added boost to daily skin care routines. 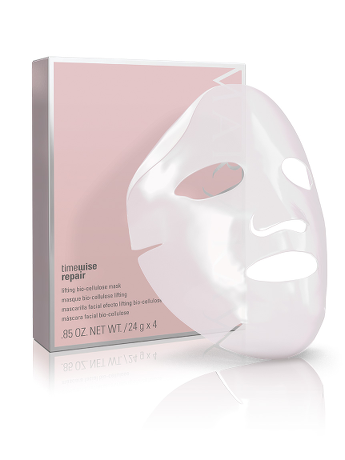 The TimeWise Repair® Lifting Bio-Cellulose Mask is an exciting addition to the TimeWise Repair® regimen. The mask visibly lifts and firms skin in just two weeks* and leaves it visibly more radiant after the very first use. * Plus, this innovative beauty-booster is an uplifting experience you’ll come to crave. For maximum benefits, use the mask twice a week to complement your TimeWise Repair® regimen. Remove mask from packet and unfold. Mask is between two protective mesh layers; remove one layer of mesh, and apply mask to clean, dry face. Position the mask on the forehead, cheeks, nose, mouth and around the eyes for a perfect fit. The eyelid flaps can either be folded back or left gently resting on the eyelids. Gently smooth the mask so it is completely fitted against the skin. Carefully remove the remaining top layer of mesh. Leave mask on face for 20 to 30 minutes, and then remove. Gently massage skin; do not rinse off. Do not reuse. So, What Makes This Mask So Innovative? The innovation comes in the form of bio-cellulose, a pure, plant-based material derived from coconut water. Its interlocking fibers form a highly absorbent, three-dimensional “fabric,” allowing the mask to be generously infused with a complex of beneficial ingredients. This complex includes oat kernel extract, orchid extract and sodium hyaluronate, known for its skin-conditioning benefits. This flexible material also gives the TimeWise Repair® Lifting Bio-Cellulose Mask a unique, face-hugging fit, keeping skin in close contact with the complex during 20 to 30 minutes of pampering “me” time.